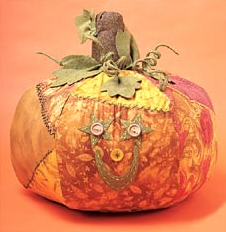 This adorable Patchy Pumpkin is a happy addition to your Halloween decor collection!! 1. Enlarge pattern pieces (pumpkin and leaves) as big as you'd like (as long as they fit on the fabric you have). 2. From one fat quarter, trace and cut out circle for pumpkin bottom. 3. Trace and cut out 6 pumpkin sections from remaining fat quarters. If you'd like, stitch several smaller pieces of fabric together in a crazy-quilt style. Embroider as desired. 4. Stitch/embroider face on one pumpkin section. 5. Stitch pumpkin sections right sides together, leaving an opening to turn; the stem piece will cover opening. 6. Stitch circle to bottom, easing where necessary. Turn and stuff. 7. Cut out stem piece. Stitch right sides together. Gather short ends of stem, pull gathering threads tightly, and tie off. Turn stem right side out and stuff lightly. 8. Turning raw edge of stem under 1/4", stitch stem to top of pumpkin. 9. To make vines, cut several 2” x 12” lengths of felt. Fold felt around a pipe cleaner. Stitch close to the pipe cleaner, and trim close to stitching. To make vine curly, twist felt-covered pipe cleaner around a dowel or marker. Glue vines to top of pumpkin. 10. Trace pumpkin leaves on felt and cut out. Stitch small tuck at rounded end of leaf as desired to create dimension. Glue or stitch to top of pumpkin. 11. Place on dining room table and enjoy your Patchy Pumpkin!